How was your Christmas Day? My husband and I went to SM Mall of Asia for a cup of Malagos Hot Tsokolate and Bibingka Pancake at IHOP. But before we indulge to our recent favorites, we went to see the movie schedules for Metro Manila Film Festival "Kubot", "My Big Bossing" and "English Only, Please"
There was a long queue to the ticketing area, good thing though Jonel brought his SM Prestige Card and E-Plus card, a special lane for E-Plus holder so we only spent few minutes at the counter. I've watched the first episode, entitle "Tiktik", for me it was a great horror/suspense movie. Director Erik Matti created a movie with just the right blend of horror, comedy and light drama. Lotlot De Leon's acting was so real, natural and deserves the Best Supporting Actress. I love the visual effects and the artists' makeup. 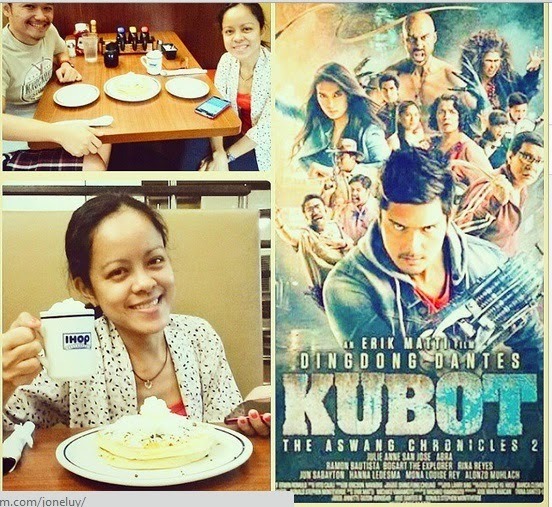 Congratulations Dingdong Dantes and the rest of the cast! Aside from Kubot, there's two MMFF entries I wanted to watch - Vic Sotto's My Big Bossing and Jennylyn Mercado's "English Only, Please". Both are light and funny movies. My Big Bossing though is for the kids and kids at heart. The movie has three (3) episodes - Sirena, Taktak and Princesa. What do movies do you recommend?